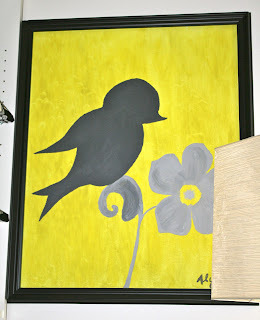 I'm working on a DIY apartment mudroom, but it's taking a day or two extra so it won't be featured til next week. That puts us a *titch* behind, but there is still apartment goodness over here! I've been working on these two pieces for our bathroom this week, but have wanted to make them for months. I mentioned a long time ago that the Madeline series was really inspiring, illustration wise. I took my cues from the pages of Ludwig Bemelmans. So I prefer to make it instead myself instead of shelling out the dough. Unfortunately, I'm not an artist... haha. That has inspired me to learn how to cheat my way through art, and I'll share a little bit with you as we walk through the process of my latest two pieces. (2) Edge it. I wanted to add an effect... this is totally optional. I've never been to any sort of art school, so my methods could be awful. 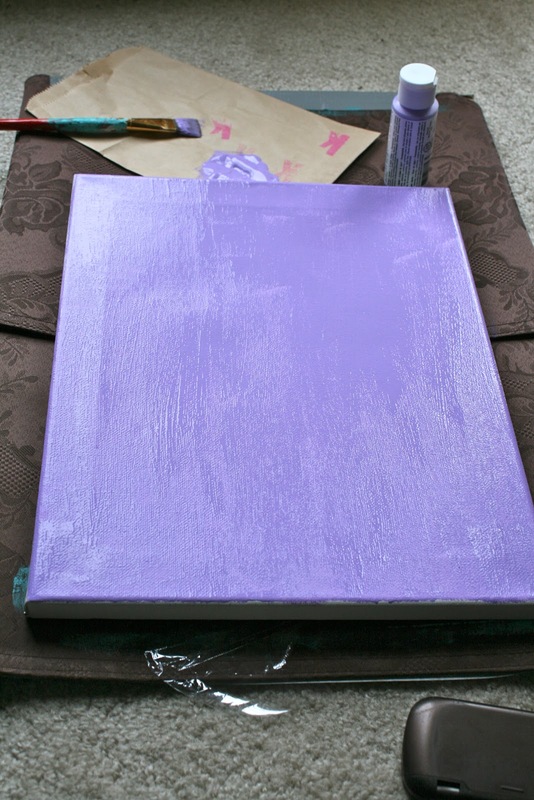 I put a thick layer of dark grey paint at the bottom of the canvas. Immediately, I took my brush and starting at the bottom where the grey was, I stroked it all the way in a straight line to the very top. 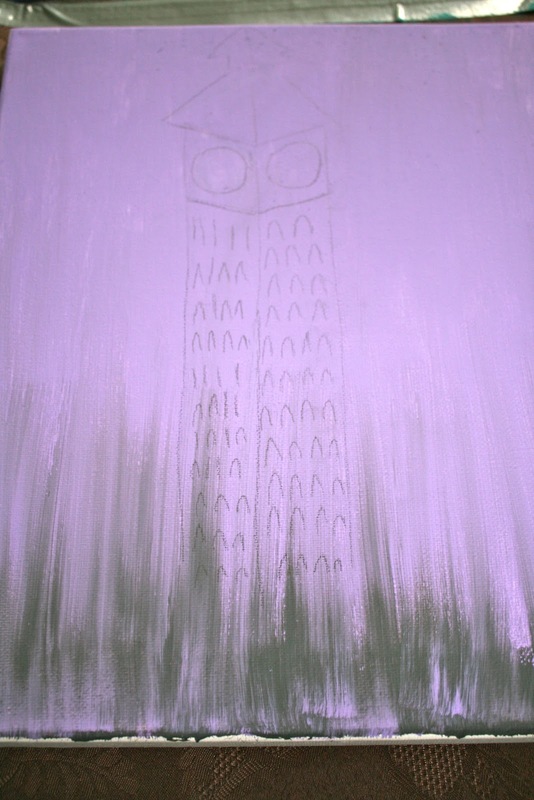 That gave me a nice effect where the grey completely fades out at the top. Once you hit the top, start over again right next to the first line and complete til you've spread all of the edging color upwards. (3) Trace it. Use pencil to trace your design. Want to get crazy? Have access to an old school projector with transparencies? This is where you can get really cheat-y. All you need to do is print out the design (or lettering) you like on to a transparency. 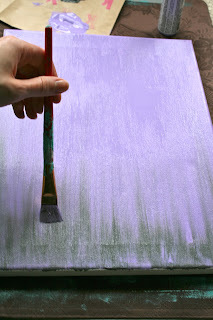 Then shine it on to your canvas (instead of the wall) and trace it. You can even choose how big/small it is by moving it closer or further (like you would on the wall). I just free-handed mine while looking at the inspiration. The whole feel of Ludwig's illustrations is very simple. 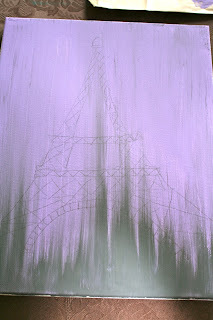 Nothing is *perfect*, so I didn't want to make mine perfect and resisted the urge to straighten any lines! However, normally I'd use pencil and erase/redo as necessary. (4) Detail it. Go over your finalized penciling in paint. I didn't want to use multiple colors, but obviously you can paint with as many as you'd like! (5) Display it. All done! I may frame these, but I haven't decided yet. I used 3M Command Hooks to display them. Almost all of our art is hung using either those hooks OR the Monkey/Gorilla hooks. I like command for when I'm hanging something lighter (less than 10 lbs) because it doesn't require any holes and they really do stay up. However, be SUPER careful when removing them. I recently took off a chunk of paint :/ The Monkey/Gorilla hooks are awesome for heavier things (75 lbs!) they are made to hang in dry wall (take that, stud finder! I will never master you...) and only make a hole the same size as a nail. Love it! Here are two pieces from our living room that I made following the same process. They're both based on birds and again, are both very simple. If you aren't an artist (and can't use the projection/tracing method) then keep the art as simple as possible. The less complex the shapes, the better your piece will turn out. Notice too that I didn't even attempt shading or anything other than silhouettes for the birds. It's much more fail proof! If you haven't noticed, our living room is grey, yellow, black and white. It's really depressing because this color scheme has become super trendy for homes and weddings (thanks, pinterest.) and now I want to change it! Before my BFF and I got married (we were married within a year of each other) we spent hours, weeks ...months... charting out color schemes for our homes. And I was sooo careful about choosing schemes that weren't popular or trendy. I didn't want our home to look dated. Well. It happened anyway! It's like when you try to choose an obscure name for your child and the name you picked ends up making the top 10 list that year. It happens all the time. Busy, busy week for us! I hope it has gone very well for you so far and continues to be fantastic! All the best, and as always, thanks for reading! They are fantastic! I love the yellow and now I know why lol.. Thinking about it now that you've mentioned it I have been seeing a lot of the yellow scheme on Pinterest. Nevertheless you work is beautiful! haha, thank you! I have a big fear of it becoming the aqua + brown of the 50s... though those colors *are* coming back around now! 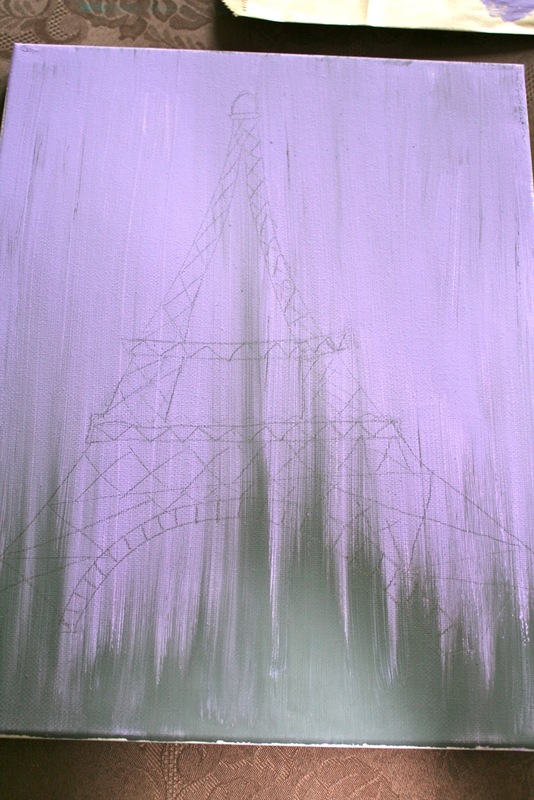 I like the Eiffel Tower and the purple. I do alot of photoshop and collages but am really intimitated to draw anything - but I may give your technique a go. Also love your tags: bad, can't, not and cheap LOL! Beautiful art! Thank you for sharing. I'm trying my hand at painting canvas for art in our home. 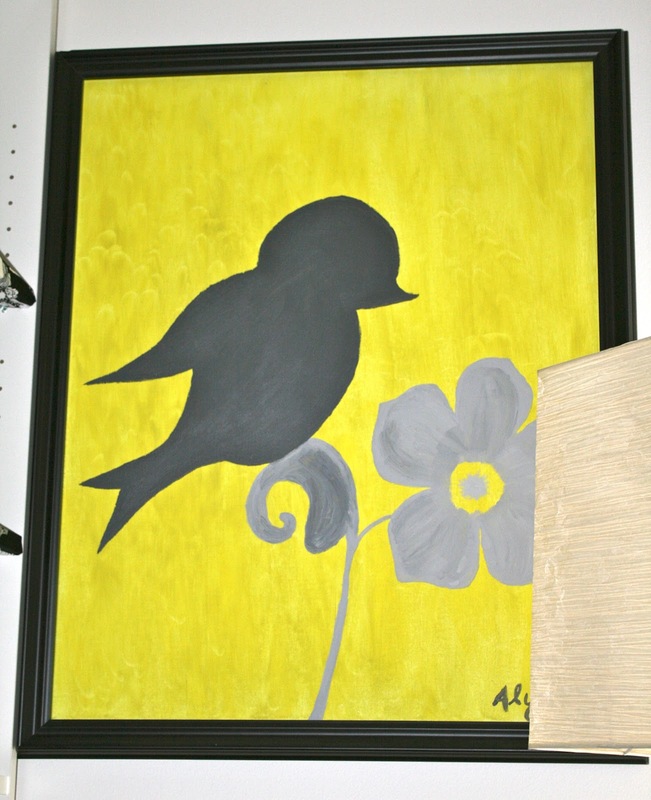 I love the textured look in the background on your yellow single bird painting. How did you do it? Thanks for the ideas. I want to give it a try. What type of paint did you use? Acrylic?